Note: The NKL17FF has been replaced by the NKU32FF. For information on the new model please click here. 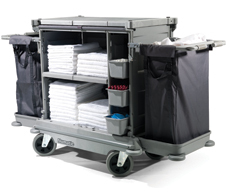 The NKL17FF includes a full twin capacity hideaway front cover system, hi-mobility soft ride chassis, 3 internal storage drawers and 2 x 100-litre laundry bag extensions.